Today I have a few ideas for decorating your home or apartment without having to deal with long term commitment. These temporary decor ideas will give you the option later to change your look or to decorate your apartment while preventing damage. 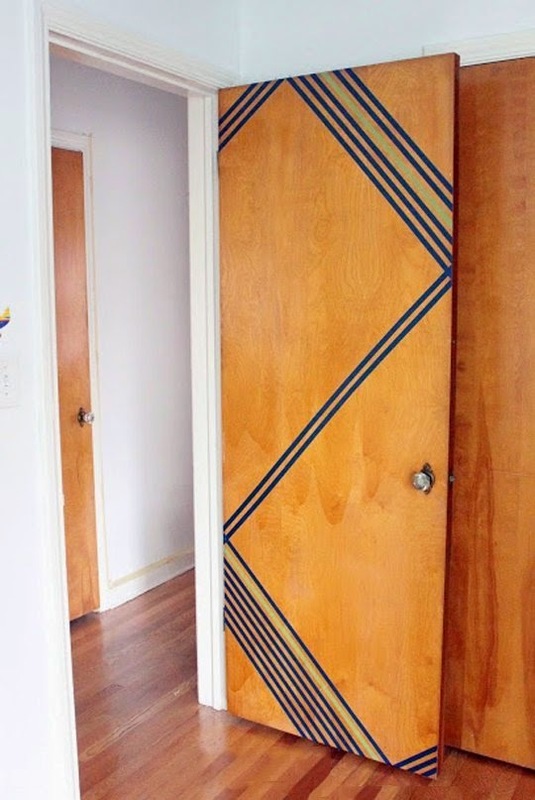 Whether you're decorating an apartment or a dorm, this is an easy way to add personality without damaging your doors and with so many varieties of Washi Tape to choose from, you can add your own style. This is a great way to update counter tops in your home or apartment for a fraction of the cost and because it's peel and stick, there's no damage if you decide to move. 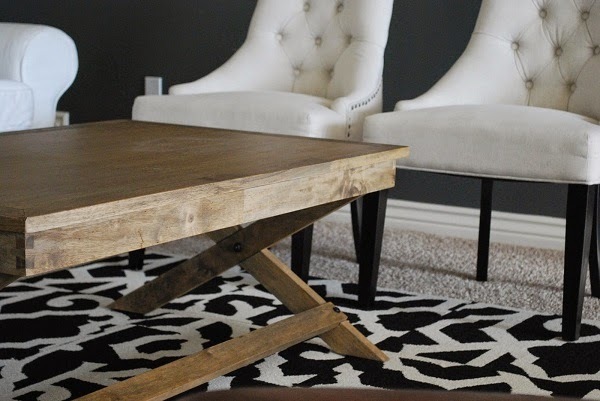 This is probably the best way to add character and style to a space without going long term. I personally love this gold chevron! This is a great option for a child's room or on a blank wall in a room for kids to doodle. This will not only prevent them from damaging the other walls with their 'art' but can be removed easily. 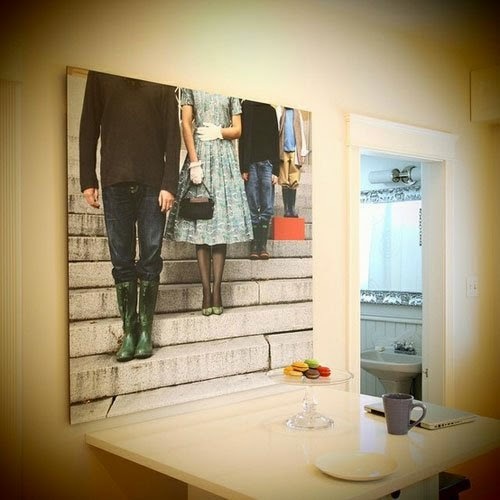 You can easily create large photos by taking your favorite photo to Kinkos and have them enlarge it for you. It's fairly inexpensive and can dress up any wall or area on a larger scale especially plain white walls that can't be painted. Using decorative film in your home or apartment helps you to conceal unsightly views and ad character to your space. You can place these on windows in lieu of curtains or on a door with a window for added privacy. Utilizing mirrors in your small space adds dimension and makes a room feel larger. Hang mirrors with command strips to avoid damage to your walls. Renoing a space and removing tiles is expensive and time consuming. This is definitely not an option when renting so what can you do to make them better? 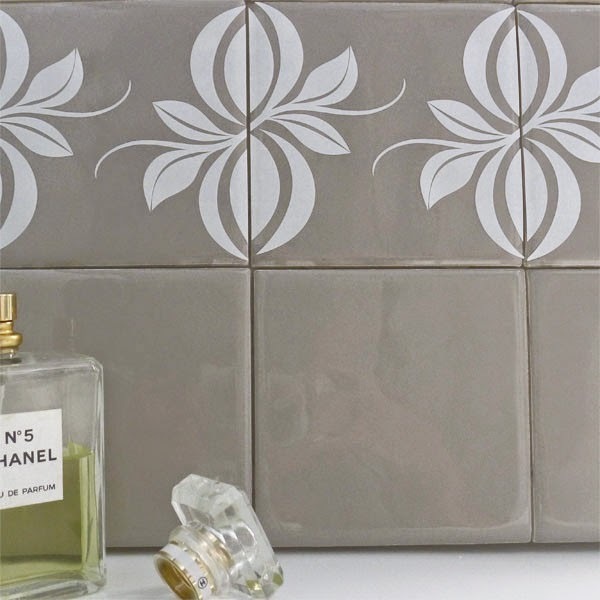 Use tile tattoos! Have built ins? Can't paint your walls because you rent? Using bookshelves or built ins to your advantage by adding back splashes to the shelves! 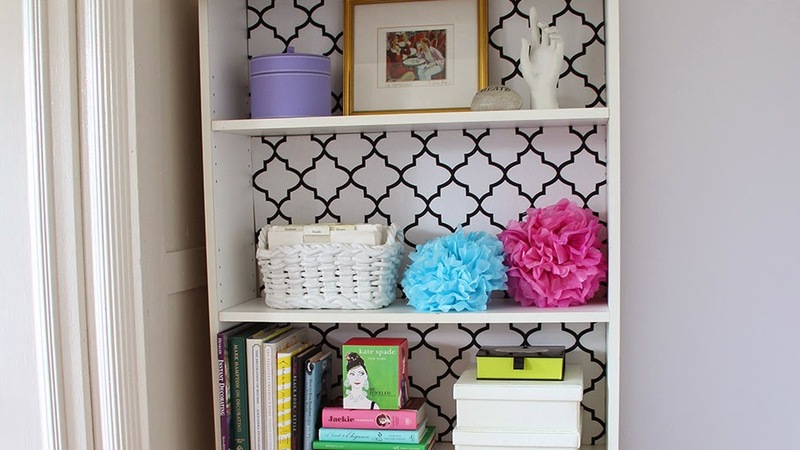 Simply cover cardboard with fabric or decorative shelf liner to add visual interest to your otherwise bland space. It's simple and removable. This is a great way to break up a solid wall-to-wall carpeting in an apartment or space in your home when tearing it up is just not an option. This will add dimension to the space and create visual interest as well. You can also change them out when you change your space. I came across many of these while surfing the web for decorating ideas. Since many like myself rent, it has opened my eyes to the possibilities. I hope I've inspired you as well! 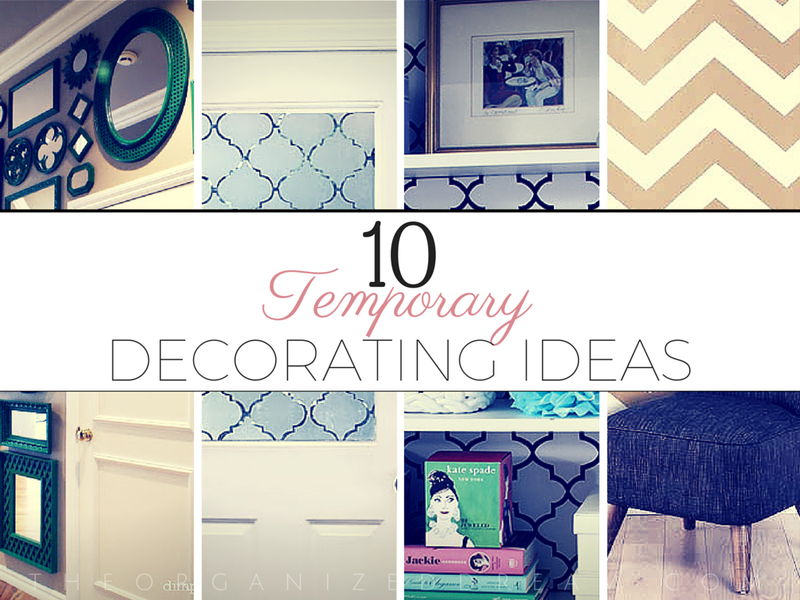 Do you have any tips on temporary decorating? Share them below! Yes! They're a few of my favorites! Such adorable ideas! 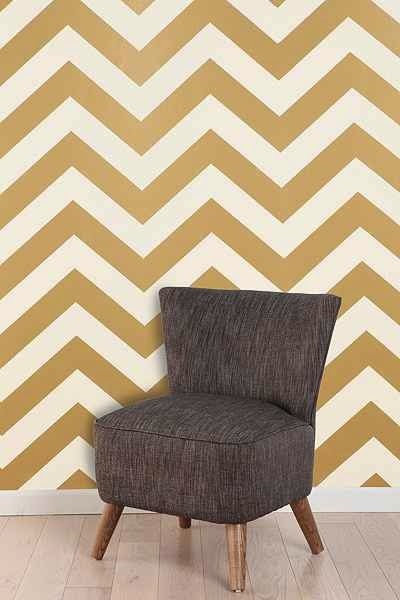 I LOVE the gold chevron wall too! So into that right now! Aren't they great? I love #7. 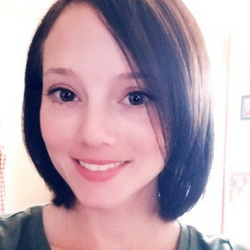 I linked this post as a fave that I found this week over at www.simplisticchaos.com, my brand new blog. Awesome! I'll check it out! Thanks! Some brilliant inspiration here I particularly like the new counter top idea! I know. I don't know about it until I was looking around the web. I definitely would like to try it! I need to save this post. 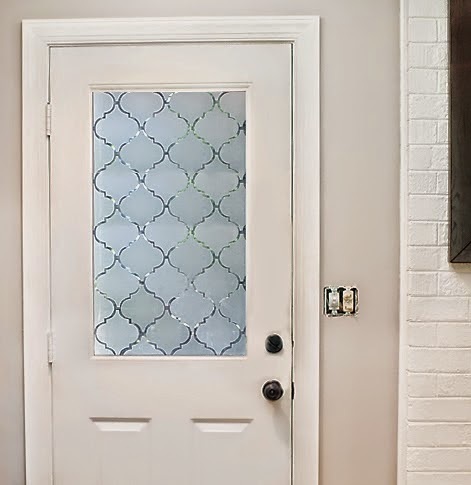 We are getting ready to move, and sprucing up a new home with some of these ideas (like the temp wall paper and the frosted glass look) would make the whole thing a lot more exciting. I love all of these ideas. We own our home now but as someone who rented for 14 years and was desperate to decorate some of these would have been the perfect solution for me. I love these ideas. I have a friend who wants to re-do their kitchen. 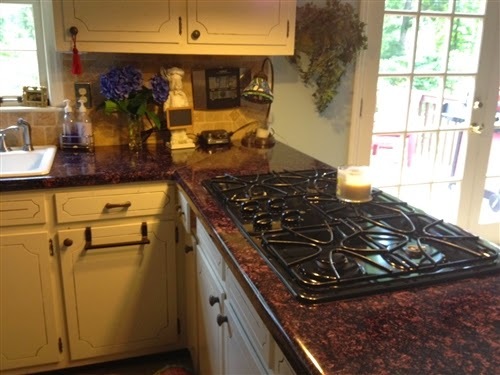 They don't have the $$ to spend on granite but these countertops may just be the ticket until they can afford the real thing. I did not know 1/2 of these existed. Thanks so much. Ohh, I definitely needed these ideas! 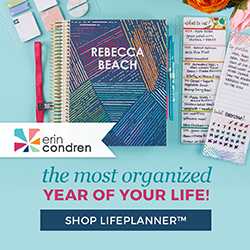 I am so tired of renting because I feel like I can't decorate! Thank you for linking up with us for Pinworthy Wednesday! Glad to party with you! Wonderfully curated collection! I'm loving the wall of green mirrors. 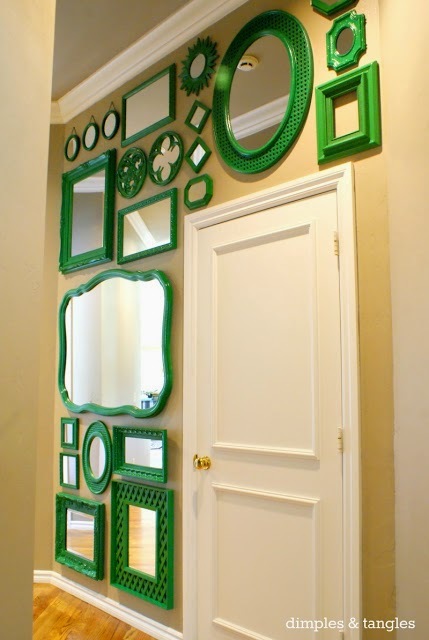 Great way to add some love to cheap mirrors too! Thanks, Jennifer! :) I've always loved this idea! Great ideas, I'd like to say that places like Walmart can also enlarge your family photos and even put them on gallery wrapped canvas so you don't need a frame to hang them! I didn't know you could do this at Walmart! Thanks for letting me know! What a great assortment of ideas!! Love them!! Thanks for sharing on My 2 Favorite Things on Thursday!! Hope you come back tomorrow and share some more great stuff!! Pinned! I love partying with you! Thanks for the pin! Awesome ideas! Thanks for sharing these at the Teach Me Tuesday linky party. You will be featured this week as the most clicked link. Please grab a "featured" button if you don't have one already. Thank you Kimberly! Thanks for the invite!